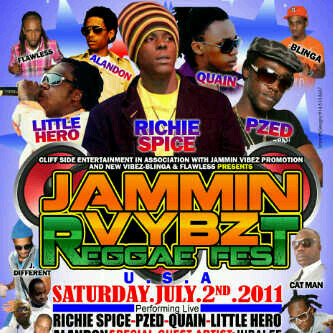 iDancehallReggae.com::Caribbean Lifestyle Media::: Richie Spice Management Responds to Promoter Allegations! Richie Spice Management Responds to Promoter Allegations! Caribbean Lifestyle Media: In a recently published article we discussed the allegations made by promotional group Cliff Side Entertainment (Sharon Rose) threatening to sue Richie Spice and possible taking action to revoke his visa. In our efforts here at Caribbean Lifestyle Media to always be fair and get both sides of the story, we contacted Richie Spice management Sophia Campbell to answer the allegations that were made. Campbell provided us with a response defending her artist and providing some clarification about what took place from their perspective on July 2nd, 2011 in Hartford, CT. Campbell told us, "One of the most professional performers of his reign, Richie Spice is viewed by many as an icon, a performing act to be experienced, a veteran at his craft and one that can be entrusted to deliver his message to all, no matter the class or creed. Since lately, according to allegations made by Cliff Side Entertainment, he may be categorized as a no show act, all that is just fable, trying to demean and underestimate our Reggae entertainer, who derive from Jamaica." Spice's management confirmed that they did receive a deposit and went on to provide clarification about Cliff Side Entertainment allegations. Campbell told us, "The promoter did pay the 50% deposit and bought airfare tickets for 4 persons as stated, however, we were scheduled to do a promotional tour, arranged by VP Records for the artiste’s 5th studio album, ‘Book Of Job’, we discussed and agreed with the promoter to pay half the airfare, based on what the promoter said they would cost. The deal was accepted and completed by Sheron Rose and VP Records." In regards to Cliff Side Entertainment statements that Richie Spice management said, "“If Richie don’t get some sleep I Sheron Rose would not like the outcome”. Campbell said, we assisted with promotion by doing quite a number of interviews scheduled by the promoter from a month leading up to the date of the show at their request. All arrangements leading up to date of the show, that were not in writing, were communicated, agreed and confirmed by, Sheron Rose, and myself, some were verbally agreed. We got to Hartford at exactly 9am Saturday July 2 and were told to then drive further to Bridgeport for Promotion, that was inhumane for the artiste and all promotion was agreed on in Hartford. We were scheduled to do 2 radio interviews, live, which only one was done because no-one turned up to take us to the second interview. There are two sides to any story, may say three. Campbell finished by stating, "The promoter, Sheron Rose [Cliff Side Entertainment] was called numerous times throughout the day to show up at the hotel and clear not just her balance but the other agreed expenses. Each phone call came with a promised time of arrival and up until 1:30am, there was no-show and no payment. At 2am, the final call to her, we were then told that she didn’t have the balance and the only other alternate arrangement she made was asking the artiste to arrive at the venue 15 minutes before closing, 3am, and give a 10 minute performance so as to avoid a riot. We most definitely would like to apologize to the loyal and new fans that didn’t get to see Richie Spice perform as advertised, however, the promoters forfeited their end of the agreement. We need promoters, in the future, to understand that business cannot continue to be dealt with in this fashion and will not be accepted, by any artiste. Richie Spice operates a professional business and prefers to decline any date that is not organized, it is just unfortunate that we cannot foresee these kinds of dealing before the artiste arrives at the destinations." There you have it compare the original story on Cliff Side Entertainment allegations and you decide.